Charlie Poole extolled the raucous, wild life of society’s outcasts on his famous reinterpretation of the great African American composer W.C. Handy’s 1917 blues composition, “Beale St. Blues.” It remains unclear whether Poole actually visited Memphis’ famed Beale Street during his travels. But what is certain is that he fully participated in the raucous subculture he depicts in “He Rambled” and “Ramblin’ Blues,” drinking bootleg whiskey, gambling, getting into fistfights and close scrapes with the law, sobering up in small-town jails, and perhaps even soliciting prostitutes. Far from a homebody himself, Poole may have recorded songs about life’s seamy underside because their antisocial ideology so closely corresponded with his own. Both of these selections elevate the selfish pursuit of excitement and pleasure over steady productive labor and responsible citizenship. As such, they promote immediate gratification rather than a New South capitalist ethos of industry, self-discipline, and thriftiness. And unlike the North Carolina Ramblers’ sentimental ballads, neither of these songs expresses any regret for or guilt about someone or something left behind or lost. Nor do the colorful characters within them aspire to a respectable working-class life of family, home, steady jobs, and church attendance. These gamblers and rounders clearly prefer instead to live a shiftless, nomadic life on the margins of “decent” southern society. Like Poole, they found their own social and cultural niche outside of the American mainstream. In February 1931, a Hollywood motion picture company hired him to bring his band to California to perform in a low-budget western. Poole celebrated by assembling a crew of his hard-drinking buddies and embarking on a marathon thirteen-week bender, part of which he spent carousing in southwestern Virginia and playing music when the mood struck him. 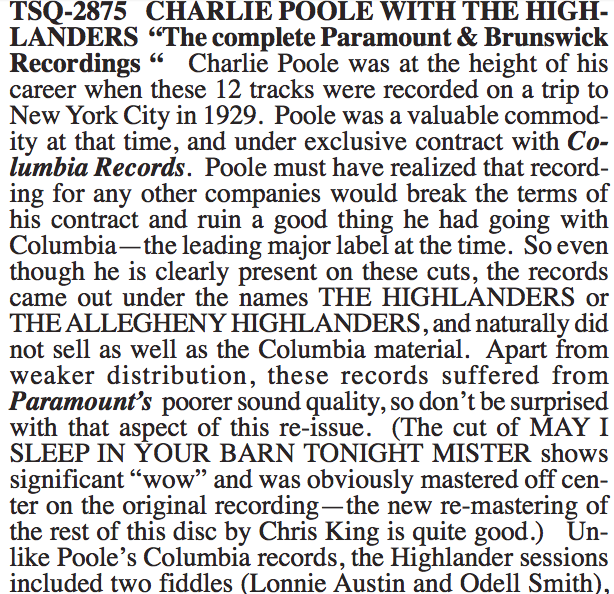 On August 13, 1962, Eugene W. Earle and Archie Green interviewed Charlie Poole, Jr., son of Charlie Poole, in Mountain Home, Tennessee. Here is an excerpt from their tapescript.